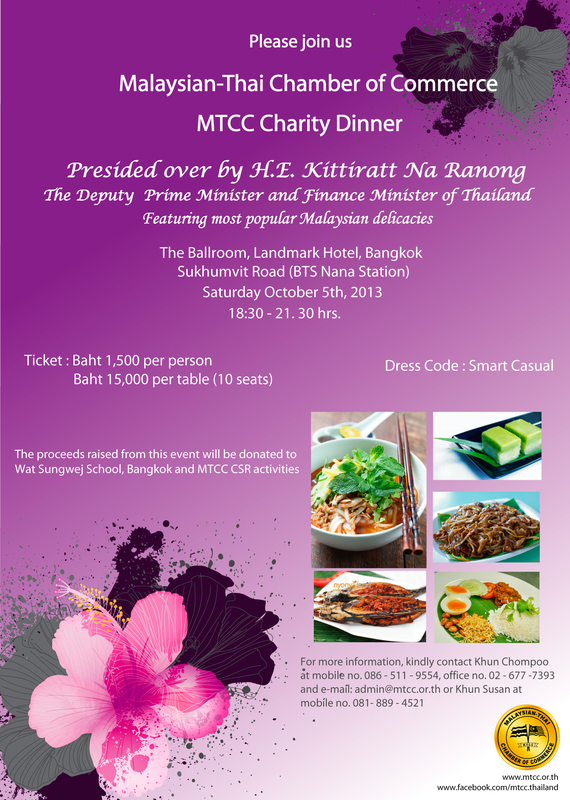 The MTCC is organizing a Charity Dinner principally to raise funds to support Wat Sungwej School in Bangkok and, also, to support the Chamber?s CSR activities. There will be an exciting program with many prizes for the lucky draw and popular Malaysian food and delicacies will also be served. Time: 18:00 ? 21.30 hrs. 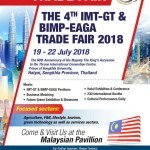 The Guest of Honor will be the Deputy Prime Minister and Finance Minister His Excellency Kittiratt Na Ranong, and our patron the Ambassador of Malaysia to the Kingdom of Thailand, Her Excellency Dato? Nazirah Hussain will also be attending the function. 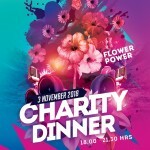 We would like to invite you to join this special social event. 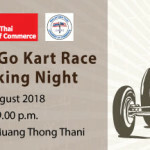 Table tickets are priced at Baht 15,000 for a table of 10 persons and Individual tickets are priced at Baht 1,500 per ticket. To enable us to plan this memorable event efficiently, we look forward to your strong support, and hope to receive your kind response before Friday 20th September 2013. For your kind convenience, our contact person is Khun Kedsuda (Chompoo), the MTCC Administrator who can be reached at mobile number: 0865119554, office number: 026777393, and e-mail: admin@mtcc.or.th. We look forward to your kind support to enable us to make this grand occasion a great success.